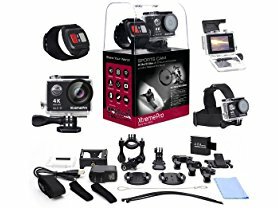 Today only this XtremePro 4K Ultra HD Sports Camera Bundle with Wireless Wrist Remote and 20 Accessories is just $49.99 (Reg. $199.99)! 4K ULTRA HD: Take incredible photos in ultra HD which has 4 times the resolution of traditional HD cameras. You can also take 4K video at 25fps or use the incredibly smooth 1080p at 60fps for faster paced action. WIRELESS WRIST REMOTE: The waterproof and 2.4gHz wireless wrist strap remote is a perfect companion. No more looking to your XtremePro to start and stop recordings or snap photos. You have full control of your XtremePro right from your wrist. WIFI & HDMI: Built-in Wi-Fifor wireless connectivity with all your smart devices. Connect to your iOS or Android devices directly. You can see a live feed of your XtremePro directly on your smart device. HDMI port also built in for direct connection to any port. ACCESSORIES INCLUDED: A 20-in-1 Accessory Kit Included. These accessories are designed to securely fasten the APB to anything. Mounts and accessories included include head-strap, bike, pole, Velcro, and wire just to name a few.